The summer of 2006 members of the kayewoods-quilting-friends Yahoo! group did a signature block swap. 48 people participated and we each received a block signed by Kaye Wood (hers is in the middle). I put the center of the quilt together, but didn’t quite know where to go from there. My husband pushed me to work out side of my normal traditional box and finish the quilt in a non-traditional manner. The piece measures 43″ x 54″ and hangs in my hallway. I finished the piece 1/5/07. 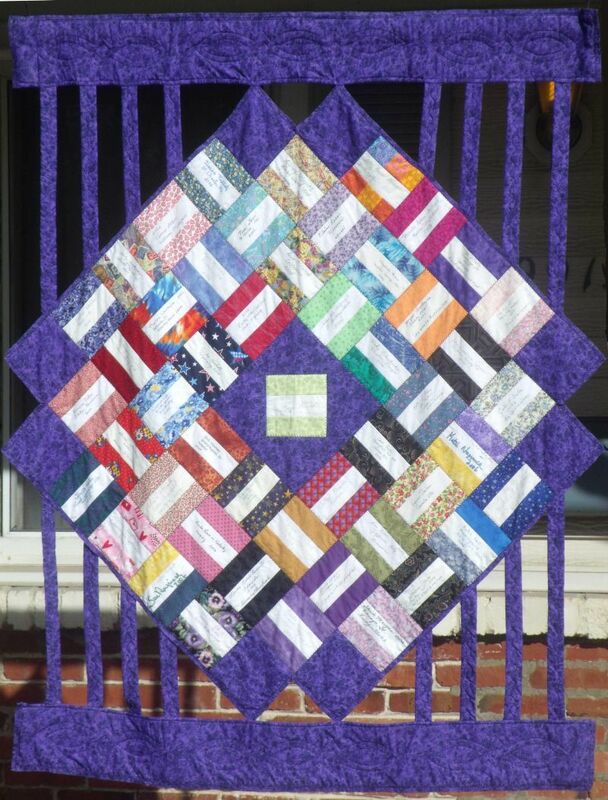 I’ve entered it in this weekend contest “Group Exchange Quilts” at the Quilting Gallery. Do hop over and check out the other group exchange quilts. Love this quilt!!! Would you do a tutorial on how you finished it??? Totally amazing!!!!!!!!!!! !